Marvel Entertainment has a really big birthday coming up. The prolific company is turning 75 this year, and to celebrate the milestone anniversary, Marvel has partnered with ABC for a primetime TV special. 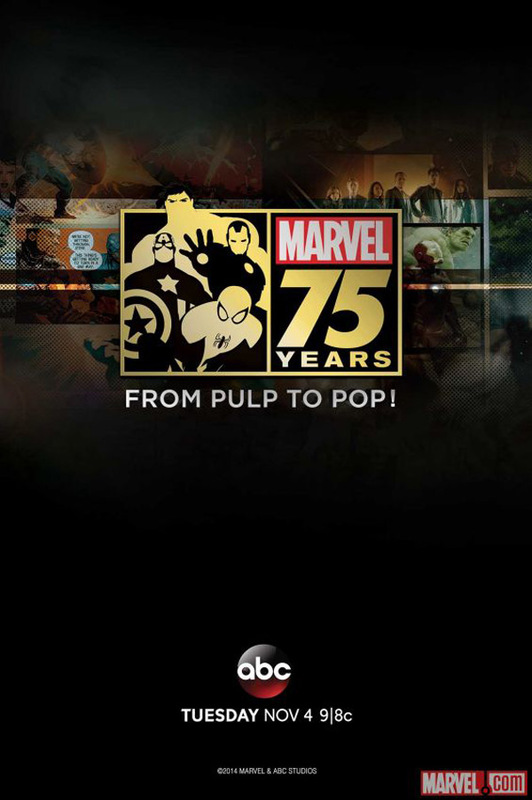 The special will roll with the title Marvel 75 Years: From Pulp to Pop! and will be hosted by none other than Emily VanCamp. VanCamp’s not as big as many of the names involved with Marvel, either cinematically or otherwise, but she’s actually a great fit to host Marvel 75 Years: From Pulp to Pop!. Marvel fans will know her from Captain America: The Winter Soldier, where she played Kate/ Agent 13/ Sharon Carter. In the flick, she plays a key role, starting when Nick Fury hires her to keep an eye on Steve Rogers. She’s also important to ABC, where she stars in the soapy drama, Revenge. With ties to both ABC and Marvel, she’s a nice choice for the gig. Beyond the casting news, a poster was also released related to the big event. The documentary will run for an hour, and will look back at Marvel’s last 75 years, beginning in 1939. Marvel is also promising “exclusive interviews” although no names are listed, as well as “an extraordinary peek into Marvel's future.” Again, the company is staying mum about what that could mean. Obviously, there are a few different directions this could go in. This could be a movie announcement, a casting announcement, or even a segment looking at projects the company has already announced. We know Marvel has been considering a Black Panther movie, but that hasn’t been officially announced. Then, the company has projects like Deadpool that have been announced, but haven’t signed on a lead, yet. Finally, Guardians of The Galaxy 2, Ant-Man, Doctor Strange, Captain America 3 and Avengers 2: Age of Ultron are all in various stages of development, and the peek at Marvel’s future could literally involve any of those projects, as well. A little bit of each of those things would be the best-case scenario, obviously, but we’ll have to wait and see how the special pans out. The special will air on Tuesday, November 4 at 9 p.m. ET. This means it will be taking over the Agents of S.H.I.E.L.D. timeslot, which means S.H.I.E.L.D. is likely off of the schedule that night, unless ABC cuts its comedy hour or Forever and shifts S.H.I.E.L.D. into a different timeslot. It’s not unusual for shows to take a week or two off in November, and we’ll let you know how ABC finagles its schedule to give Marvel 75 Years: From Pulp to Pop! a cushy premiere. In any event, Marvel is promising more information over the next several weeks, so we’ll keep you posted.